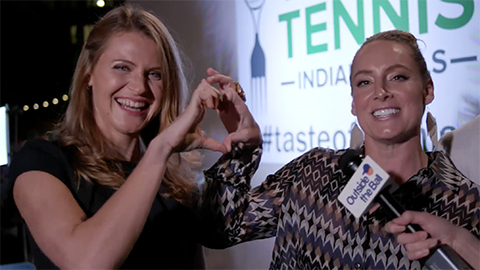 Bethanie Mattek-Sands and Lucie Safarova make a great team, and they have their 5 Grand Slam titles, choreographed dance routines and an endless amount of playful selfies to prove it! 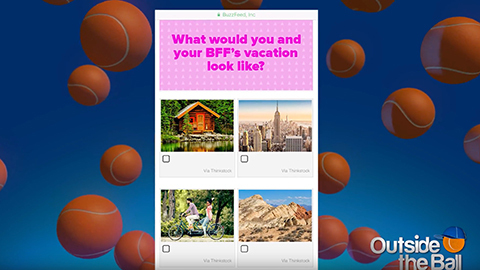 In this video, the dynamic duo joins Outside the Ball at Taste of Tennis to take a BFF Perfect Match Quiz. We find out how they create such a strong bond, and even an ATP tennis pro didn’t want to be left out of the action. Our host Mayleen Ramey presented the accomplished doubles team with the BFF Perfect Match Quiz that dived into the pair describing themselves in emojis and music genres. Bethanie and Lucie quickly agreed that “hip hop” represented them the best and admitted that their dancing days on the court aren’t over. “Actually, we’re going to add on to the dance we started in Australia.” Mattek-Sands stated. From white sandy beaches to the snow covered Alps, when it comes to relaxation it’s important for a tennis player to pick the perfect location for them to unwind after weeks of training and hard hitting match play. Safarova pointed to a quaint little log cabin, “I would say this one!” Mattek-Sands nodded in agreement. “Well, we want to go to a zen monastery and do a little retreat. That’s one of the things we’ve talked about!” she explained. ATP tennis pro and #NextGen star Francis Tiafoe crashed the quiz. “This is my favorite WTA player! My idol! Bethanie is gangster on tour, I love it!” Tiafoe revealed as he wrapped his arms around her shoulders. The ladies burst into a chorus of “awes”. Tiafoe stayed for the remainder of the video which included him and his idol coming up with a BFF handshake. Not to be outdone, Safarova and Ramey created one of their own. This video is a match worth watching as it’s filled with colorful insights into one of the greatest doubles teams on tour, from their on court celebrations to off court retreats. Fans will surely fall in love with their chemistry, just like the smitten and comical Francis Tiafoe!